Economists Lucas Chancel and Thomas Piketty recently concluded after a long study that inequality is at its peak in India. It is embedded in popular conscience: “Top 1 per cent of earners captured 22 per cent of total income in the country.” Their study–covering consumption, government accounts and income tax data from 1922 when income tax was introduced in India till 2014–found that income inequality has increased. Top 1 per cent of earners accounted 21 per cent of all income in 1922. During 1980s, popularly known as the Hindu growth rate era, it dropped to 6 per cent. It increased sharply from 1990s onwards. For the wage-earning middle class, this came as a worrying sign. A debate is brewing in the corporate world over rationalising salary across hierarchy. It has emerged as a verdict on capitalism’s most feared aspect of benefiting a few at the cost of others. In this debate, now imagine another economy: the economy of the farmers or the economy of India’s largely poor. Inequality of income among the small and marginal farmers group, the semi- and medium and the large farmers group is stark. The lowest among the farmers groups in term of landholding earns the least. 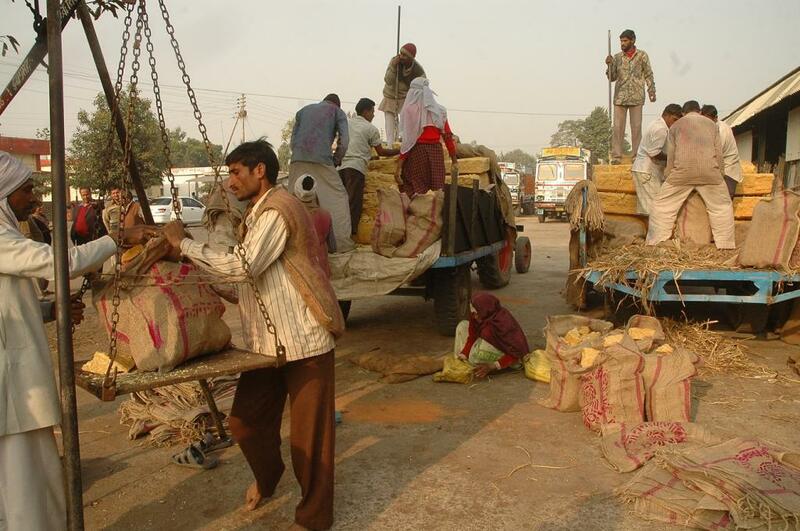 And India primarily consists of small and marginal farmers defined as having landholding below two hectares (Ha). India’s 85 per cent of landholdings are below 2 Ha. Let’s look at the income equality among various landholding groups. According to the Committee on Doubling of Farmers’ Income, the average annual earning of a small and marginal farmer household was Rs 79,779 in 2015-16. Now compare this with the earning of large farmers having a landholding above 10 Ha. Such farmers earned seven-and-a-half times more than a small and marginal farmer, or to be specific Rs 605,393 each year. A medium and semi-medium farmer’s household earned Rs 201,083 or two-and-a-half times more than a small and marginal farmer’s household. It means 85 per cent of farmer households earn 9 per cent of total income while the rest earn 91 per cent. If you compare this with overall inequality in India, it is far high. “The initial promise of agrarian reforms was to distribute land to the landless and provide title of ownership to the cultivators. However, unfortunately, India’s agrarian reforms did not ensure egalitarianism in the agricultural community,” says the Dalwai Committee Report asking for agriculture policies to factor in this aspect while crafting ways to double farmers’ income by 2022 as promised by Prime Minister Narendra Modi. It means the “recovery phase” in agriculture with nearly 4 per cent growth in 2004-14 must have bypassed this marginalised majority among the farmers. It is not just among various landholding groups, there is a distinct variation in income level across states depending on level of agricultural growth. According to a research paper by Sanjoy Chakravorty, S Chandrasekhar and Karthikeya Naraparaju for the Indira Gandhi Institute of Development Research (IGIDR), monthly per capita income from cultivation was Rs 2,311 in Punjab while it was just Rs 250 in West Bengal. It is a nine-fold difference. More to it, “monthly expenditures exceeded income in three of the largest states in the country—West Bengal, Uttar Pradesh, and Bihar—and, correspondingly, the average income of households with less than one hectare of land was less than consumption”. The IGIDR study summed up: “Land possession was the key variable in determining income from cultivation, which accounted for half of income inequality, and hence was the key variable in explaining income inequality.” Farmers with 0.5 Ha of land don’t earn enough to cover their expenditures. This raises a pertinent issue that has policy ramifications. The Green Revolution in 1960s focused on increasing productivity and yield. But since then landholding has fragmented significantly. Marginal landholdings have tripled in the last 40 years. It means the old strategy might not reap the same objectives. This aspect is important in the context of the government’s target of doubling farmers’ income. Small farmers take longer to increase their income in comparison to large farmers. For example, during 2003-13, households with over 10 Ha of land have been able to double income. But a small farmer with up to 1 Ha of land could increase income by just 50 per cent during the same time. It means the government has to apply income group-specific strategy to achieve its target of doubling farmers’ income. And just to reiterate the country’s massive small farmer’s population: average size of 67 per cent of all landholding in India is 0.39 Ha. The challenge of making farming lucrative just got tougher. According to government reports, the stagnation in government expenditure has led to reduction in non-farm job creations. So, the majority of small and marginal farmers, who don’t earn much from cultivation, would not be able to access alternative sources of livelihoods as well. This rings the proverbial alarm bells. It is quite reasonable to expect that a sincere effort is made to revive the pride in agriculture, by making farming economically viable and also environmentally sustainable in the long run and, introduction of effective insurance schemes to cover losses -as the agriculture economists point out. But an attempt like suicide is not directly the result of economic loss. It is more related to capacity to bear psychological discomfort. One is not troubled by loss, defame, relationship problems but due to dependence upon religious-spiritual ideas, intoxications, entertainments for relief, the capacity to absorb psychological discomforts is weakened. Can one see that apart from immediate physical danger, all discomforts-loss, defame, relationship problems- are psychological discomforts? To absorb this discomfort is the whole point. Now any action including to increase income can be effectively taken by the individual. A radical change in thinking, a short-circuit in the thinking process is required. One is essentially adjusting, postponing by thinking as if future will be alright, God will take care. One is postponing the bearing of discomfort now. Entertainments, intoxications, religious-spiritual activities overwhelm us. We escape our pain and uncertainty by the relief promised by these diversions. We think our discomfort is over once we log in to these activities. Discomfort is there is the texture of every moment. Discomfort of uncertainty, discomfort of others not behaving as you want, discomfort of things not maturing as you want. Due to dependence upon diversions for relief, the capacity to absorb psychological discomforts is weakened. If 2004 -2014 shows highest agricultural growth then MMS and Sharad Pawar should be consulted to enable double the farm gain in income.